Pressed into service when World War II breaks out in the Pacific, the USS Walker—a Great-War vintage “four-stacker” destroyer—finds itself in full retreat from pursuit by Japanese battleships. Its captain, Lieutenant Commander Matthew Patrick Reddy, knows that he and his crew are in dire straits. In desperation, he heads Walker into a squall, hoping it will give them cover—and emerges somewhere else. Familiar landmarks appear, but the water teems with monstrous, vicious fish. And there appear to be dinosaurs grazing on the plains of Bali. Gradually Matt and his crew must accept the fact that they are in an alternate world—and they are not alone. Humans have not evolved, but two other species have. And they are at war. With its steam power and weaponry, Walker’s very existence could alter the balance of power. And for Matt and his crew, who have the means to turn a primitive war into a genocidal Armageddon, one thing becomes clear. They must decide whose side they’re on. Because whoever they choose to side with is the winner. I'd never heard of this book when I grabbed it off the library shelf. I'm glad I did. It was a fun read. It's reminiscent of the works of S. M. Stirling but I find Anderson's writing to be more accessible and easy to read. 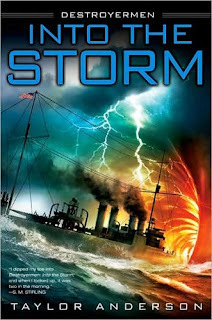 (I love Stirling's work as well but his writing is very dense) This book had likable characters and adventure aplenty. To be honest, the battle scenes got a bit tedious but I don't like to read battle scenes too much. You could just say, "They had a battle and won it" and I'd be happy. I'm more about character development, great dialogue and a good story. This one had enough of all that to keep me interested and to possibly keep reading the series. Anderson's work is a bit easier to read than Stirling's. Stirling has a habit of writing more than a "simple" story, but I think Anderon is stepping up his game a bit (at least that's what I felt after reading the third book in his series). I'm hoping the more he adds to the series, the better his style gets.